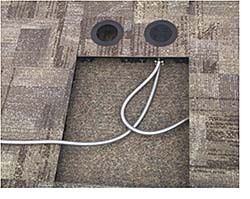 PowerFlor raised floor cable management system features prefabricated floor panels which contain up to four recessed grommets, each containing the user's choice of power, telecom, and data ports. Commercial carpet is preinstalled on the panels. Panels can be picked up and moved to another location without special tools.